The Law Library Microform Consortium (LLMC) recently assembled from various sources and digitized an extensive collection of early laws, codes, and jurisprudence from Myanmar (Burma) covering the years 1872-1955. LLMC prioritized the content based on the interests expressed by legal scholars and students at the School of Law at Fordham University, who were conducting field research in Myanmar on human rights challenges. This project was supported by CRL's partnership with LLMC. The 1947 Constitution of the Union of Burma, used from the country's independence in 1948 to 1962. 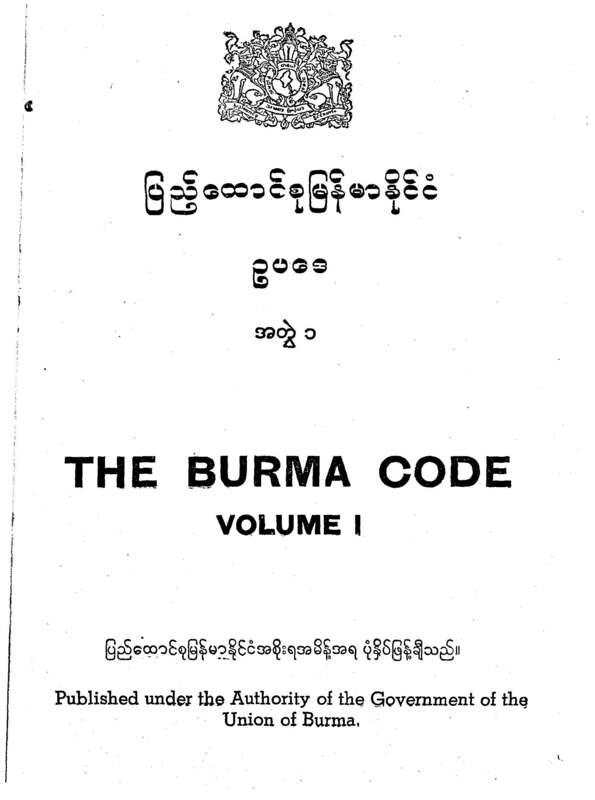 Several editions of the colonial Burma Code, including the 13-volume set issued in 1955, covering laws enacted and still in force from 1818 to 1954 (in English and Burmese). Digests and law reports, such as the All India Reporter covering judgments of the Lower and Upper Chief Courts through 1922, and Rangoon High Court from 1923-1947. To complete the collection LLMC collected and scanned nearly 50 titles (over 250 volumes), sourced from four different libraries. Researchers at CRL member institutions now have access to these important sources of law through LLMC-Digital. These primary legal documents are available to aid scholars in many fields as they conduct research in the history, jurisprudence, and culture of Myanmar. Libraries that contributed content to this collection include: the University of Chicago's D'Angelo Law Library, Saint Louis University, the Library of the Association of the Bar of the City of New York, and the Los Angeles County Law Library.